This article is about the source code of your site. An example of the source code that should appear in the <head> section when viewing the page source is below. If you are not familiar with checking the page source code, please see this article. Is the required WordPress function used by your theme? Check your theme's header.php file for a call to wp_head(). This function is required to output the Yoast SEO meta tags. If your theme does not include this function, please contact your theme developer to request compatibility with our plugin. Was a default meta description template added? Verify that a meta description template has been added in the Yoast SEO settings under Admin > SEO > Search Appearance for the content type in question. Does the post or page have a custom meta description? 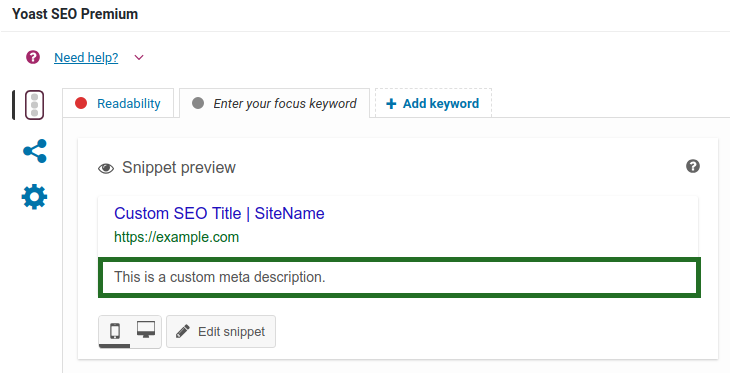 Confirm that a meta description has been added directly to the Yoast SEO metabox on the individual post or page. If no description was added, please write one, update the post or page and check the source code again. If the description appears in the source code but is incorrect, please read this article.